Before we get started, let me take a moment to emphasize that I actually did listen to every second of every song on Justin Bieber’s Christmas album, Under the Mistletoe. And let me also emphasize that when I say that certain parts of this album are awful, I’m not just saying using an ad bieberum argument; the album is just really, really, legitimately bad. Not much needs to be said about a Justin Bieber Christmas album. It’s made up of the pop star’s typical love songs to the tweenage girls of America, but saturated with overt references to the Yuletide season. Unless Bieber’s trying to woo Mrs. Claus or a female elf, he won’t have much luck, because no normal human girl could tolerate so many nods at Christmas cheer (Bieber goes from kissing sweethearts under the mistletoe to asking a girl to “be his Christmas eve” [???????] to any number of other grimace-inducing moments). It was through these numerous and blatant Christmas references that I began to wonder if this Christmas album was actually Bieber’s idea. He simply doesn’t seem all that excited about it; I imagine him as a cow in the recording studio, with the record execs squeezing his udders to produce liquid gold. Rammed in between these original songs are covers of all the classic Christmas songs, on which, if this was even possible, Bieber puts forth even less effort. These songs are points where the album becomes everything I feared it would be. 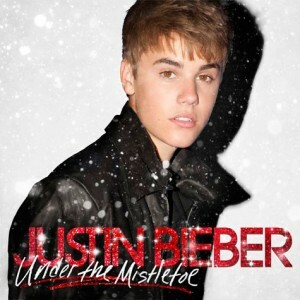 “The Christmas Album (Chesnuts Roasting on an Open Fire)” is ruined by Bieber trying to sound like a soul singer by warbling the living daylights out of every single note, and “Santa Claus Is Coming to Town” is butchered even worse by a cacophony of piano slides and tambourine shakes and a choir that pops up at random like the moles in Whack-a-Mole. These songs earn Bieber a special place in the Purgatory of Pop Music for being so absolutely pathetic; why couldn’t he have been good, for goodness’s sake? Perhaps what saves the album from being totally unlistenable is its slew of guest stars, though even these may just make the album really funny as well as really bad. The one shining star of the lineup is Busta Rhymes, who in delivering a hilarious verse on “Drummer Boy” sacrifices himself like Jesus to total embarrassment in order to save the album from total despair. The others are like Ron Paul’s attempts at the presidency: they were only funny the first time. Boys II Men probably weren’t told that they were working with Bieber before they showed up to the studio, and it took me two minutes to figure out if it was Bieber or Mariah Carey who was singing on “All I Want for Christmas Is You (Superfestive!) Duet with Mariah Carey” (I’m told that’s the song’s official name). There was a part of me that hoped this album might at least be listenable for Bieber’s fans, but deep down, the rest of me knew it was going to be awful. From the weird hissing on the first track (was he spitting into the microphone or something?) to Bieber looking drunk off egg nog on the album cover to his absolute bloody slaughter of “Silent Night” to close the disc, the album is at best an amusing toy, and, like plenty of children’s Christmas gifts, even that doesn’t last very long. Despite whatever the general opinion might be of Justin Bieber. He continues to shine in a world hard to shine in. Justin Bieber should have not ever come in 2 the spotlight I he hit’s rock bottom soon! I listen to some of Justin Bieber’s songs, but I agree. This album is bad , I got it for my birthday and it was almost the worst birthday present I almost got. i agree i do not like the new song mistletoe because there isnt really a good message. i do like justin bieber just not really this song. If we’re lucky he’ll end up the same way.